@Zion Road | Get Your Grub On! I spend the whole day on roller coasters with friends at Universal Studios and as the day got older we got tried and really hungry. So solve the second problem we went to ‘Peperoni’ on Zion Road, which is in one of the shophouses just opposite of Great World City. I have never been here before but really liked the seating outside, a bistro feeling. 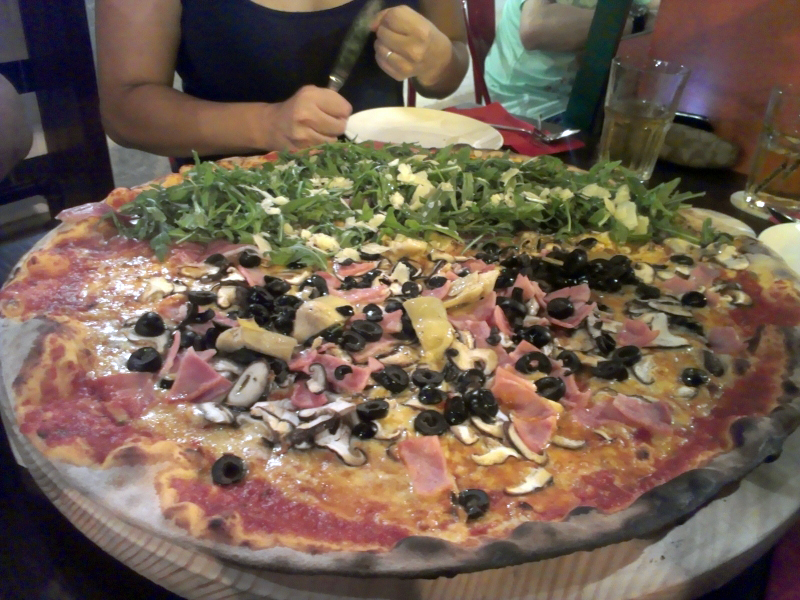 Since I never had but always wanted to we ordered one of their massive 21″ mega pizzas half half. One half with ‘Capricciosa‘ (shitake, ham, artichokes and black olives), the other with ‘Prosciutto Grudo di Parma‘ (parma ham and rocket). This thing was tremendous, just like the pizzas from the opening scenes of Roseanne. I loved it, the dough was pretty thin, very crisp on the outside rim and more and more juicy towards the inside of the pie. The sugo tasted great and nicely tomato-y and was covered with the right amount of cheese; maybe not exactly but close. The parma ham was from good quality and had a delicious nutty taste nicely accompanied by the bitterness of the rocket salad and covered with a lot of salty parmigiano reggiano. The ham on the ‘Capricciosa‘ half tasted quite good but could have been cut a bit thinner and even though I always would prefer button mushrooms or chanterelle the shitake were thin and tasty. The black olives were good and heaps and so the only neglected ingredient were the very few carciofo or artichokes. 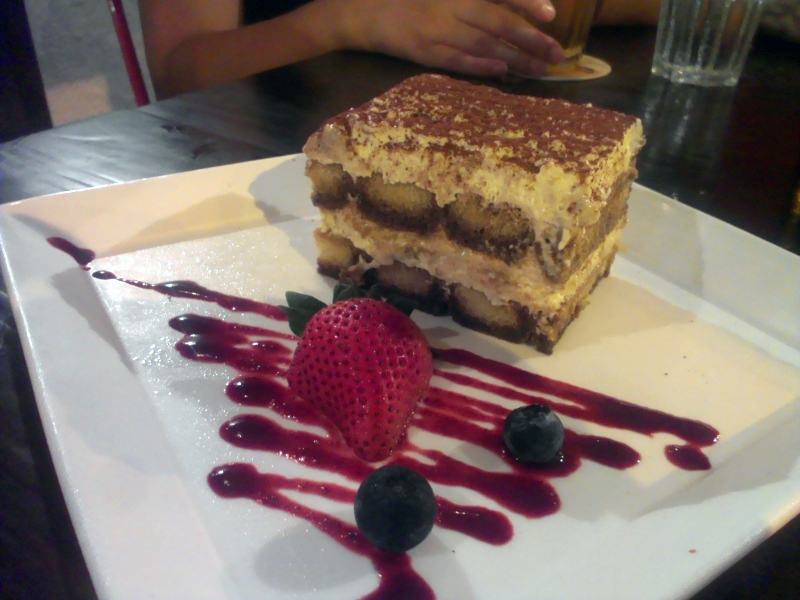 As our first dessert we had the ‘Tiramusi‘ which was quite nice and not too heavy. I found the ladyfingers a tad too big which made it taste a bit watery and they also could have gone a bit heavier on the kahlua and the coffee. Not bad but also not outstanding. 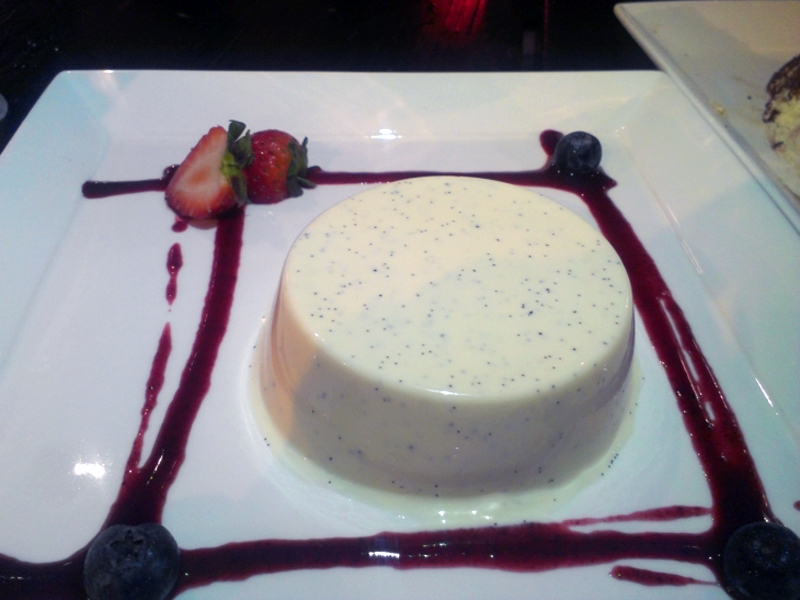 My personal choice was the ‘Panna Cotta‘ which was actually pretty darn good. I’m not big with desserts other than ice cream, but if I come across this one I usually get it. It was spotted with vanilla grains and super light so I totally forgot that it’s pretty much pure cream. The sour fruity berry sauce was a great combination to the sweetness and made this a nice closer for the dinner and a long day. I really have to mention our outstanding waitress, who was super friendly, fast, attentive and overly helpful with all our requests. It’s kinda sad that great service really stands out that much but that’s how it is and this one was awesome. The ‘Peperoni’ branch on Zion is a really nice and casual place to come with friends and to enjoy some of the better pizzas (and service) in town. I’ll come back, grazie mille.